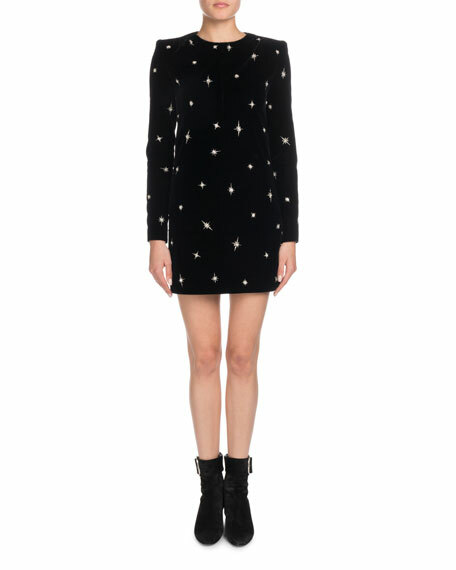 Saint Laurent chemise cocktail dress with allover star embroidery. Bailey 44 "Do The Hustle" cocktail dress with tonal sequined panels. Crew neckline. Sleeveless; cut-in shoulders. Body-conscious silhouette. Hem hits above the knee. Concealed back zip. Rayon/nylon/spandex. Combo, nylon/spandex. Made in USA. Model's measurements: Height 5'10"/177cm, bust 33"/84cm, waist 25.6"/65.2cm, hips 35.8"/91cm, dress size US 2-4/FR 34-36. 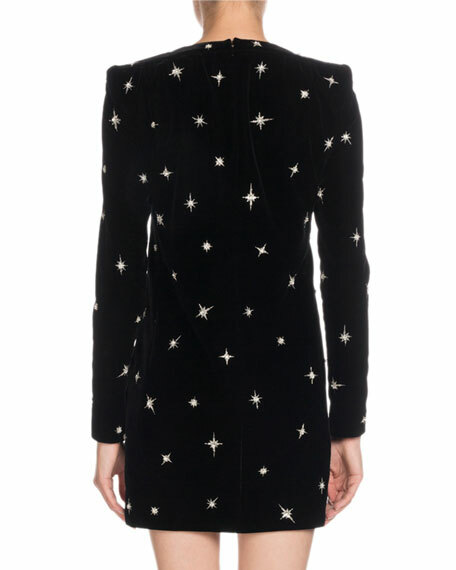 Jenny Packham "Astra" crepe cocktail dress. Boat neckline. Long sleeves with beaded stripes. A-line silhouette. Hidden back zip. Knee-length. Polyester/polyurethane. Jenny Packham "Astra" crepe cocktail dress. Boat neckline. Long sleeves with beaded stripes. A-line silhouette. Hidden back zip. Knee-length. Polyester/polyurethane. Lining, polyester/spandex. Imported. Model's measurements: Height 5'10"/177cm, bust 31"/79cm, waist 24"/61cm, hips 34"/86cm, dress size US 0/2.